It has been much too long since I've posted- mostly because I've been hard at work being craftee! This is my favorite time of year and I wish I could spend all my time making our house beautiful and creating gifts for everyone I know, but instead I spend my days working as an assistant- a job that has more to do with making coffee and copies than creating beauty. I day dream most of my day away, thinking of what I will create when I get home and spend every available minute reading blogs and gaining inspiration for my upcoming projects. Often I get home and all I want to do is sit on the couch with a glass of wine, snuggle with Brandon and the pup and watch mindless TV, but lately I have actually been productive so let me share with you the latest projects! 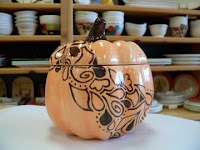 In the beginning of October I painted this here pumpkin at Color Me Mine. While I was painting the owner of the studio told me it was eligible to enter their pumpkin contest. I wasn't particularly pleased with the progress so I didn't think I had much chance, but I entered anyway. It took two sessions of painting to make the pumpkin I saw in my head a reality but I left it there hoping for the best. A few weeks later an email went out asking people to vote for their favorite pumpkin. One child and one adult would win a $50 gift card to Color Me Mine (very useful since things aren't cheap and it's one of my favorite ways to spend an afternoon). I thought about sending an email to everyone I knew asking them to vote for me, but I didn't...I voted for myself and then waited. And waited. Finally I got an email with the results and my little pumpkin won! This is the first time I've won anything as far back as I can remember. Hooray! I've already spent the giftcard on some wonderful Christmasy pottery (that won't be done in time for Christmas). I've taken a bit of a break from jewelry since October and need to replenish the etsy shop after Christmas (because people actually buy things!!) but here's my most recent creation- a necklace that right now is for sale in the shop, but I will be a little sad to sell it. Okay, really I'll be ecstatic if it sells, but I love it and it took forever so I probably won't make one for myself anytime soon! 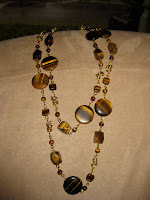 The beads are all semi-precious tiger's eye and I did all the wire wrapping and connections by hand. The real reason I haven't done much jewelry lately is that I've been working night and day on this crazy cross-stitch. I bought a pattern of Eagle Bluff Lighthouse (in Peninsula State Park in Door County) online thinking that I would make one for my mom and one for me. I didn't realize the pattern was hand drawn in the 80s by a woman who did an oil painting of the lighthouse. She hand did the pattern off of her painting and it's pure madness! She ran out of symbols for all of the different shades of brown so I sit there and go blind trying to distinguish between the % and the same sign with a a dot just on top or just on the bottom. It has taken months but I'm finally starting to see a lighthouse amongst the crazy brown x's. I told my mom I was making her a gift, that it likely wouldn't be done by Christmas and then gave her the option to receive something else on Christmas or to receive the surprise in whatever state it may be in on Christmas morning. She chose to get the surprise on Christmas, so I've been stitching like a maniac to make sure she at least recognizes it. I'm now thinking I may actually finish it by Christmas. Problem is the only thing left is stitching the snow...all white... and then the crazy backstitching which has 14 part directions. So it won't be framed but I think it may actually be done for Christmas.